It is... very nice modeling. I wish the pictures were larger so we could see more detail though. Thanks for the link. I must remember this method for unloading an ore car. The man could be attached to the dumping mechanism I think. 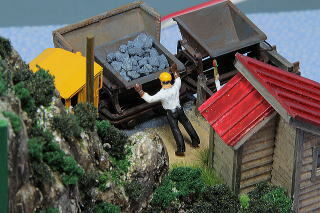 Nevadablue wrote: I must remember this method for unloading an ore car. The man could be attached to the dumping mechanism I think. Hand tipping has been done before on the forum, on a truly excellent layout that has deservedly won awards. It's a long thread, so pack a lunch! Thanks for the link Barry! Another beside reader for me. I love the marathon threads myself. LOTS of good info. By the way, I stole your singing potato signature line for use elsewhere... thanks. Nevadablue wrote: Thanks for the link Barry! Another beside reader for me. I love the marathon threads myself. LOTS of good info. There is a great section in that site about modelling water and the splash from outlook pipes is great and seemingly just done with glue on glass. One to try.